At the Conference Center of Nuremberg concurrent with SPS IPC Drives Show, ODVA announced activities with NAMUR, an international user association of automation technology in the process industries, to advance the adoption of industrial Ethernet in the process industries. The focus between NAMUR and ODVA will be an activity to continue the refinement of formal requirements for an Ethernet communication system for the process industry through joint collaboration between the Working Group 2.6 Fieldbus (WG) and the ODVA Strategic Market Requirements Team for its Process Initiative (SMRt). This activity is the outgrowth of a position paper published by the WG in February 2016. An Ethernet communication system for the process industry. This paper identified EtherNet/IP as one of the minimum binding requirements for such systems along with 32 aspects that the WG identified as targets for the adoption of industrial Ethernet by the process industry for applications using classical field devices. The WG and the SMRt have agreed to on-going discussions on the requirements for successful deployment of process field devices on industrial Ethernet spanning a wide variety of topics such as physical layer, device integration and diagnostics. NAMUR is formulating its strategy and requirements to adopt industrial Ethernet in process automation where possible, stated Mr. Sven Seintsch, chairman of NAMUR Working Group 2.6. NAMUR and its fieldbus working group welcome the opportunity to partner with ODVA, as the organization that develops and manages the EtherNet/IP technology and standards, to help accelerate adoption of industrial Ethernet in the process industry. One area of cooperation will be the installation of an EtherNet/IP system in the process automation lab at Industriepark Höchst, a center of the European process industry located in Frankfurt am Main, Germany. 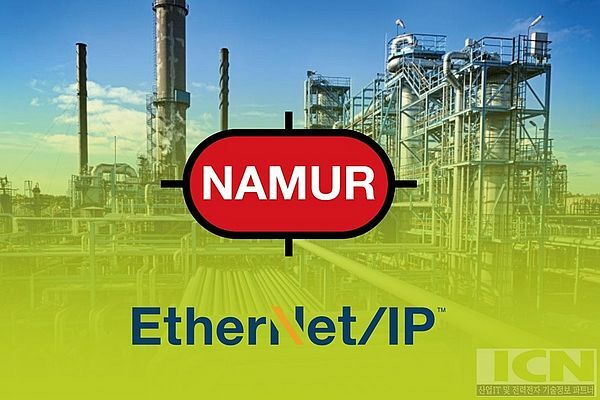 This system will be a conduit for shared learning between NAMUR and ODVA stakeholders on approaches to optimize the application of industrial Ethernet for the unique requirements of the process industry. The system will be a multi-vendor system comprised of process field devices, control systems and infrastructure from ODVA members Cisco Systems, Endress+Hauser, Rockwell Automation and Schneider Electric among others. NAMUR member Bilfinger Maintenance GmbH, a leading international engineering service provider to the process industry, will assume lead responsibility for commissioning of the EtherNet/IP system. This system will provide process users with a hands-on environment to learn more about the benefits of industrial Ethernet for process applications in general and EtherNet/IP in specific as well as to identify needs for the application of Ethernet-based process field devices versus classical fieldbus-based process field devices. In turn, automation suppliers will gain an increased understanding regarding applications and ease-of-use requirements for the process industry as it relates to Ethernet in general and EtherNet/IP in specific. Lessons learned will be fed back to the NAMUR Working Group 2.6 Fieldbus and the ODVA Strategic Market Requirements Team for its Process Initiative to help develop future roadmaps for the evolution of their respective specifications. As part of its initiative for the Optimization of Process Integration (OPI), ODVA is committed to enhancing the EtherNet/IP technology and standards to meet additional requirements of the process industry, added Ms. Katherine Voss, president of ODVA. ODVA is looking forward to its future cooperation with NAMUR and the increased mutual understanding that will result. The aim of NAMUR's investigation into Ethernet is to extend its application to traditional process field devices, concluded Mr. Michael Pelz, head of NAMUR Working Area 2 Automation Systems for Processes and Plants of which the Fieldbus working group is a part. NAMUR believes that effective and easy-to-use Ethernet communication systems between the field level and the higher system levels, such as EtherNet/IP, is a key factor for future applications with modern IoT and Industrie 4.0 solutions in the process industry." NAMUR and ODVA expect that installation of the EtherNet/IP proof-of-concept system will be completed in the first half of 2017. Both organizations expect to convene on-going meetings between the WG and SMRt over the course of calendar year 2017.